"We were finding that many of our humanitarian aid customers were reporting raids on their food and supply stores," said Chris Beck, President of Clements Worldwide. Clements Worldwide, a leading insurance broker for expatriates and commercial enterprises working abroad, has announced the launch of a new affordable solution for humanitarian aid organizations to cover all types of disbursements to at-risk populations including, but not limited to, food and household items such as mosquito nets, cooking supplies, tents, and lanterns. This is complementary to Clements Worldwide’s traditional property coverage that would include buildings, equipment, stocks & inventory, electronics, etc. Many of these items were being distributed in conjunction with government grants that would not accommodate for this leakage, which could create further complications with the grant-giving entities. Property losses were revealed as the number one source of losses according to the Winter/ Spring 2016 edition of the Clements Worldwide Risk Index, with humanitarian aid organizations more likely than other organizational types to list it as their largest source of loss. Property coverage for larger assets is standard in the industry. 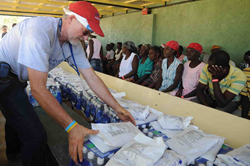 When trying to find insurance coverage for humanitarian aid inventory, however, Clements would often find the cost prohibitive for its clients. This was often driven by the high-risk environment of the countries in which aid organizations operate and the extensive nature of the coverage that was required to accommodate for theft and looting, strikes, civil unrest, war and terrorism in addition to fires and natural disaster. For more information on this product or a free consultation on your global insurance needs, contact Patricia Loria at ploria(at)clements(dot)com. Clements Worldwide is a leading insurance provider for expatriates and international organizations. Founded in 1947, Clements offers international car, property, term life, health, specialty and high-risk insurance in over 170 countries. With offices in Washington, D.C., London, and Dubai, Clements delivers comprehensive and customized coverage, superior customer service, and unparalleled claims response. To learn more or receive a quote online, visit http://www.clements.com.